The above is an excerpt from Heather Lawyer’s “Candy Corner”online about her mom. What started out as a small gathering to make four small gingerbread houses became known as “Gingerbread Day”and grew to become an annual tradition. Candy became known as “Sweet Candy,”since this was her very favorite time of year. Candy passed away in 2017 after a courageous four-year battle with cancer. In a “History of Gingerbreads” interview by Barb Lawyer Briggs with Candy, Candy explained that when she was pregnant with her and her husband Dave’s first child, Brent, in 1982, she made a gingerbread carousel for her mother-in-law, Mary Lawyer. Then, in December of 1986, when Brent and their second child, Heather, were three and four, Candy’s mother, Lynne Leahy, came across an article about a gingerbread lady where the recipe, the patterns, and directions were outlined. Lynne had always wanted to start a Leahy tradition for the kids and felt this was it. Heather’s love for her mother and her family is very evident in her actions and words. It is very obvious that the opportunity to carry this tradition is truly an honor for her. Heather claims that her all-time favorite gingerbread will always be the tribute to her Uncle Jan Lawyer. The year Jan passed away, Heather, her brothers and their wives, Renee and Stephanie, made gingerbread replicas of Jan’s Winterbrook Farm and Corn Maze. Brent and Renee did the barn, Heather did the home farm, Mitchell did the corn maze. Keep an eye open for opportunities to participate in the gingerbread classes that Heather and her brothers are hosting in the coming years. It’s a sweet time of candy-coated fun! 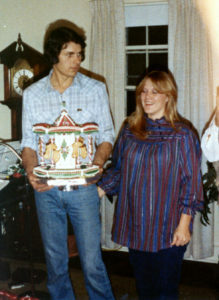 Candy Lawyer is shown with her husband, Dave, and her first gingerbread: a carousel. 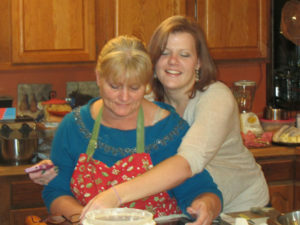 Heather Lawyer gives her mom, Candy, the Gingerbread Lady, a squeeze as they bake gingerbread in their kitchen. Candy is wearing her Gingerbread Lady apron. 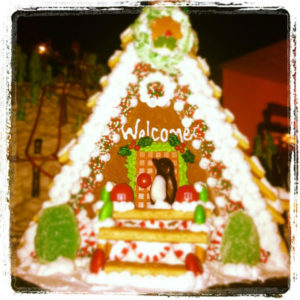 Heather’s favorite gingerbread, a ski resort.